This page provides detailed instructions on camera system calibration. Calibration overview. This tutorial video demonstrates on an older version of Motive but the general steps are still the same in the recent releases. 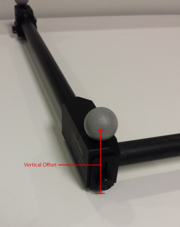 Like many other measurement systems, calibration is also essential for optical motion capture systems. During camera calibration, the system computes position and orientation of each camera and amounts of distortions in captured images. Using calibration data, Motive constructs a 3D capture volume. Specifically, this is done by observing 2D images from multiple synchronized cameras and associating the position of known calibration markers from each camera through triangulation. Note that if there is any change in a camera setup over the course of capture, the whole system will need to be recalibrated to accommodate for changes. Moreover, even if setups are not altered, calibration accuracy will naturally deteriorate over time due to ambient factors, such as fluctuation in temperature and other environmental conditions. Thus for accurate results, it is recommended to periodically calibrate the system. Duo/Trio Tracking Bars: The Duo/Trio tracking bars are self-contained and pre-calibrated prior to shipment; therefore, user calibration is not required. See: Tracking Bar Coordinate System. Prepare and optimize the capture setup. From the Camera Preview pane, clear existing masks by clicking . Open the Calibration pane, and use Mask Visible to mask extraneous reflections that cannot be removed from capture volume. Calculate and review the calibration results. By default, Motive will start up on the calibration layout containing necessary panes for the calibration process. This layout can also be accessed by clicking on a calibration layout from the top-right corner , or by using the Ctrl+1 hotkey. System settings used for calibration should be kept unchanged. If camera settings are altered after the calibration, the system would potentially need to be recalibrated. To avoid such inconveniences, it is important to optimize both hardware and software setup before the calibration. First, cameras need to be appropriately placed and configured to fully cover the capture volume. Secondly, each camera must be mounted securely so that they remain stationary during capture. Lastly, Motive's camera settings used for calibration should ideally remain unchanged throughout the capture. Re-calibration will be required if there is any significant modifications to the settings that influence the data acquisition, such as camera settings, gain settings, and Filter Switcher settings. If these settings are modified, it is recommended the system be recalibrated. masking tools available on the 2D camera preview. All extraneous reflections or unnecessary markers are ideally removed from the capture volume before calibration. In fact, the system will refuse to calibrate if there are too many reflections other than the calibration wand present in the camera views. However, in certain situations, unwanted reflections or ambient interference could not be removed from the setup. In this case, these irrelevant reflections can be ignored via using the Masking Tool. 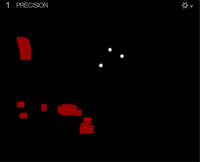 This tool applies red masks over the extraneous reflections seen from the 2D camera view, and all of the pixels in the masked regions is entirely filtered out. This is very useful when blocking unwanted reflections that could not be removed from the setup. Use the masking tool to remove any extraneous reflections before proceeding to wanding. The Mask Visible feature in the the Calibration Pane, or in the 2D Camera Preview pane ( ), automatically detects all of the existing reflections present in the 2D view and masks over them. If desired, masks be manually created by drawing , selecting rectangular regions , or selecting circular regions in the image using the masking tools, or you can also subtract masks by toggling between additive/subtractive masking modes ( add or subtract). You should be careful when using the masking features because masked pixels are completely filtered from the 2D data. In other words, the data in masked regions will not be collected for computing the 3D data, and excessive use of masking may result in data loss or frequent marker occlusions. Therefore, all removable reflective objects must be taken out or covered before the using the masking tool. After all reflections are removed or masked from the view, proceed onto the wanding process. The wanding process is the core pipeline that samples calibration data into Motive. A calibration wand is waved in front of the cameras repeatedly, allowing all cameras to see the markers. Through this process, each camera captures sample frames in order to compute their respective position and orientation in the 3D space. There are a number of calibration wands suited for different capture applications. 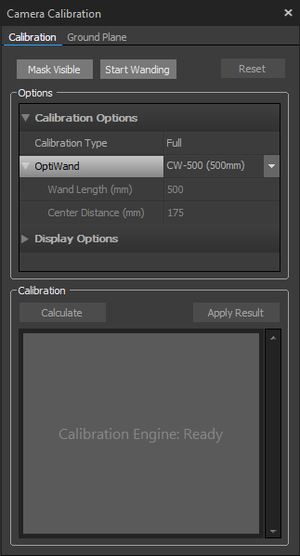 Under the OptiWands section, specify the wand that you will be using to calibrate the volume. It is very important to input the matching wand size here. When an incorrect dimension is given to Motive, the calibrated 3D volume will be scaled incorrectly. Set the Calibration Type. If you are calibrating a new capture volume, choose Full Calibration. Double check the calibration setting. Once confirmed, press Start Wanding to initiate the wanding process. Start wanding. 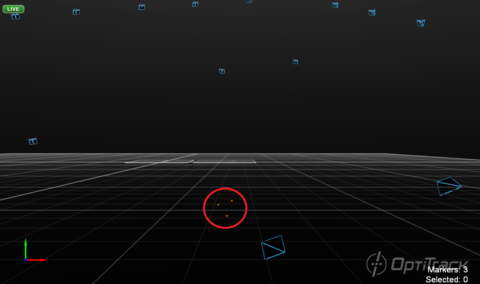 Bring your calibration wand into the capture volume and start waving the wand gently across the entire capture volume. Draw figure eight with the wand to collect samples at varying orientations, and cover as much space as possible for sufficient sampling. If you wish to start calibrating inside the volume, cover one of the markers and expose it wherever you wish to start wanding. When at least two cameras detect all the three markers while no other reflections are present in the volume, the wand will be recognized, and Motive will start collecting samples. Wanding trails will be shown in colors on the 2D view. A table displaying the status of the wanding process will show up in the Calibration pane to monitor the progress. For best results, wand the volume evenly and comprehensively throughout the volume, covering both low and high elevations. After collecting a sufficient number of samples, press the Calculate button under the Calibration section. 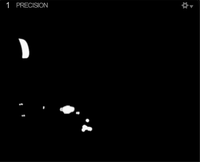 Collected wanding samples shown in the 2D Camera Preview. Avoid waving the wand too fast. This may introduce bad samples. Avoid wearing reflective clothing or accessories while wanding. This can introduce extraneous samples which can negatively affect the calibration result. Try not to collect samples beyond 10,000. Extra samples could negatively affect the calibration. Try to collect wanding samples covering different areas of each camera view. 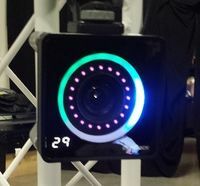 The status indicator on Prime cameras can be used to monitor the sample coverage on individual cameras. Although it is beneficial to collect samples all over the volume, it is sometimes useful to collect more samples in the vicinity of the target regions where more tracking is needed. By doing so, calibration results will have a better accuracy in the specific region. When performing calibration wanding, please make sure the Marker Labeling Mode is set to the default Passive Markers Only setting. This setting can be found under Application Settings: Application Settings → Live-Reconstruction tab → Marker Labeling Mode. There are known problems with wanding in one of the active marker labeling modes. This applies for both passive marker calibration wands and IR LED wands. For Prime series cameras, the LED indicator ring displays the status of the wanding process. As soon as the wanding is initiated, the LED ring will turn dark, and then green lights will fill up around the ring as the camera collects the sample data from the calibration wand. Eventually, the ring will be filled with green light when sufficient amount of samples are collected. A single LED will glow blue if the calibration wand is detected by the camera, and the clock position of the blue light will indicate the respective wand location in the Camera Preview pane. LED indicator ring of Prime 17W during calibration. LED indicator ring of Prime 17W when the wand is detected during calibration. After sufficient marker samples have been collected, press Calculate to calibrate using collected samples. The time needed for the calibration calculation varies depending on the number of cameras included in the setup as well as the amount of collected samples. Immediately after clicking calculate, the samples window will turn into the solver window. It will display the solver stage at the top, followed by the overall result rating and the overall quality selection. The overall result rating is the lowest rating of any one camera in the volume. The overall quality selection shows the current solver quality. Calibration details can be reviewed for recorded Takes. Select a Take in the Data pane, and related calibration results will be displayed under the Properties pane. This information is available only for Takes recorded in Motive 1.10 and above. After going through the calculation, a Calibration Result Report will pop up, and detailed information regarding the calibration will be displayed. The Calibration Result is directly related to the mean error, and will update, and the calibration result tiers are (on order from worst to best): Poor, Fair, Good, Great, Excellent, and Exceptional. If the results are acceptable, press Apply to use the result. If not, press cancel and repeat the wanding process. It is recommended to save your calibration file, for later use. 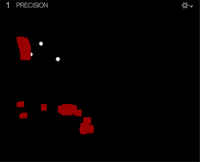 The 2D Camera Preview pane showing lens distortions along with the calibration result. 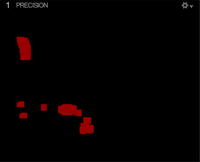 Overall Reprojection Displays the overall resulting 2D and 3D reprojection error values from the calibration. Worst Camera Displays the highest 2D and 3D reprojection error value from the calibration. Triangulation Triangulation section displays calibration results on residual offset values. Smaller residual error means more precise reconstructions. Recommended: Recommended maximum residual offset for point cloud reconstruction. Residual Mean Error: Average residual error from the calibration. Overall Wand Error Displays a mean error value of the detected wand length throughout the wanding process. Ray Length Displays a suggested maximum tracking distance, or a ray length, for each camera. 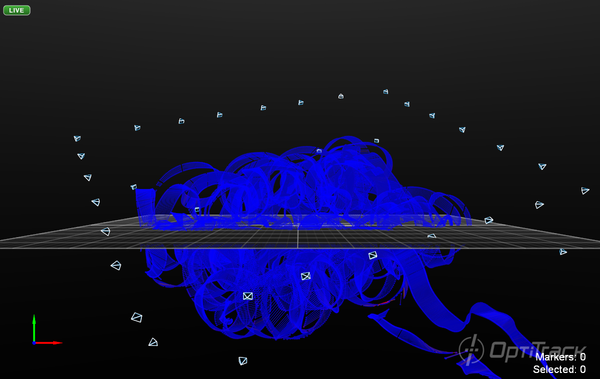 The wanding path displayed over the 3D prespective view after calibration result is accepted. Overall Result Grades the quality of the calibration result. Maximum Error (px) Displays the maximum reprojection error from the calibration. Minimum Error (px) Displays the minimum reprojection error from the calibration. Average Error (px) Displays the average reprojection error from the calibration. Wand Error (mm) Displays a mean error value of the detected wand length throughout the wanding process. Calculation Time Displays the total calculation time. Ground plane tab under the Calibration pane. The final step of the calibration process is setting the ground plane and the origin. This is accomplished by placing the calibration square in your volume and telling Motive where the calibration square is. Place the calibration square inside the volume where you want the origin to be located and the ground plane to be leveled to. The position and orientation of the calibration square will be referenced for setting the coordinate system in Motive. Align the calibration square so that it references the desired axis orientation. 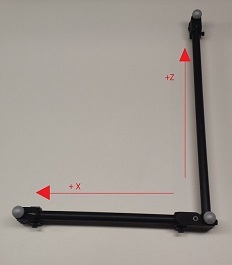 The longer leg on the calibration square will indicate the positive z axis, and shorter leg will indicate the direction of the positive x axis. Accordingly, the positive y axis will automatically be directed upward in a right-hand coordinate system. Next step is to use the level indicator on the calibration square to ensure the orientation is horizontal to the ground. If any adjustment is needed, rotate the nob beneath the markers to adjust the balance of the calibration square. 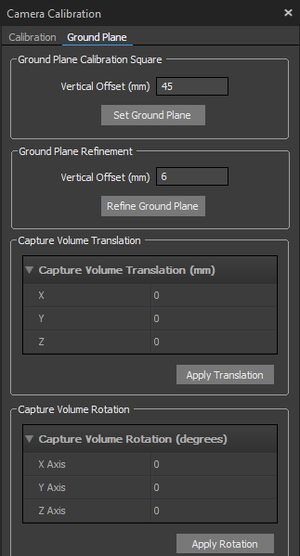 If you wish to adjust position and orientation of the global origin after the capture has been taken, you can apply the capture volume translation and rotation from the Calibration pane. After the modification has been applied, new set of 3D data must be reconstructed from the recorded 2D data. Cal Sqaure placed in the capture volume. Calibration square axis convention, Motive 1.7 and above. Duo/Trio Tracking Bars: The global origin of the tracking bars can be adjusted by using a calibration square and the Coordinate System Tools in Motive. For more information, see Tracking Bar Coordinate System page. The Vertical Offset setting in the Calibration pane is used to compensate for the offset distance between the center of markers on the calibration square and the actual ground. Defining this value takes account of the offset distance and sets the global origin slightly below the markers. Accordingly, this value should correspond to the actual distance between the center of the marker and the lowest tip at the vertex of the calibration square. When a calibration square is detected in Motive, it will recognize the type of the square used and automatically set the offset value. This setting can also be used when you want to place the ground plane at a specific elevation. A positive offset value will place the plane below the markers, and a negative value will place the plane above the markers. Ground Plane Refinement feature is used to improve the leveling of the coordinate plane. To refine the ground plane, place several markers with a known radius on the ground, and adjust the vertical offset value to the corresponding radius. You can then select these markers in Motive and press Refine Ground Plane, and it will refine the leveling of the plane using the position data from each marker. This feature is especially useful when establishing a ground plane for a large volume, because the surface may not be perfectly uniform throughout the plane. Calibration files can be used to preserve calibration results. The information from the calibration is exported or imported via the CAL file format. Calibration files reduce the effort of calibrating the system every time you open Motive. These can also be stored within the project so that it can be loaded whenever a project is accessed. By default, Motive loads the last calibration file that was created, this can be changed via the Application Settings. The continuous calibration feature continuously monitors and refines the camera calibration to its best quality. When enabled, minor distortions to the camera system setup can be adjusted automatically without wanding the volume again. In other words, you can calibrate a camera system only once and you will no longer have to worry about external distortions such as vibrations, thermal expansion on camera mounts, or small displacements on the cameras. For detailed information, read through the Continuous Calibration page. 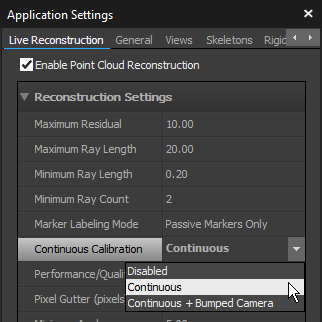 The continuous calibration can be enabled under the Reconstruction tab in the Application Settings. In this mode, the continuous calibration is enabled and Motive is continuously optimizing the camera calibration. This mode will accommodate only the minor changes, such as vibrations, thermal expansions, or minor drifts in positions and orientations of the cameras. This feature also allows Motive to continuously monitor the system calibration. Unlike the standard continuous calibration, this mode can adjust the system calibration to even drastic changes in positions and orientations of cameras. If you have cameras displaced a lot, set this setting to the bumped camera mode and Motive will accommodate for the change and reposition the bumped camera. For maintaining the calibration quality, just use the continuous mode. This mode behaves similarly to the Continuous mode. 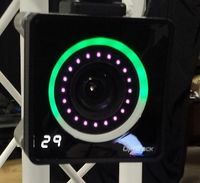 This mode, however, does not require all of the cameras to see the markers to update the calibration, allowing the continuous calibration to be used on overhead grid setups. When capturing throughout a whole day, temperature fluctuations may degrade calibration quality and you will want to recalibrate the capture volume at different times of the day. However, repeating entire calibration process could be tedious and time-consuming especially with a high camera count setup. In this case, instead of repeating the entire calibration process, you can just record Takes with the wand waves and the calibration square, and use the take to re-calibrate the volume in the post-processing. This offline calibration can save calibration calculation time on the capture day because you can process the recorded wanding take in the post-processing instead. Also, the users can inspect the collected capture data and decide to re-calibrate the recorded Take only when any signs of degraded calibration quality is seen from the captures. 1) Capture wanding/ground plane takes. At different times of the day, record wanding Takes that closely resembles the calibration wanding process. Also record corresponding ground plane Takes with calibration square set in the volume for defining the ground plane. 2) Load the recorded Wanding Take. If you wish to re-calibrate the cameras for captured Takes during playback, load the wanding take that was recorded around the same time. 3) Motive: Calibration pane. In the Edit mode, press Start Wanding. 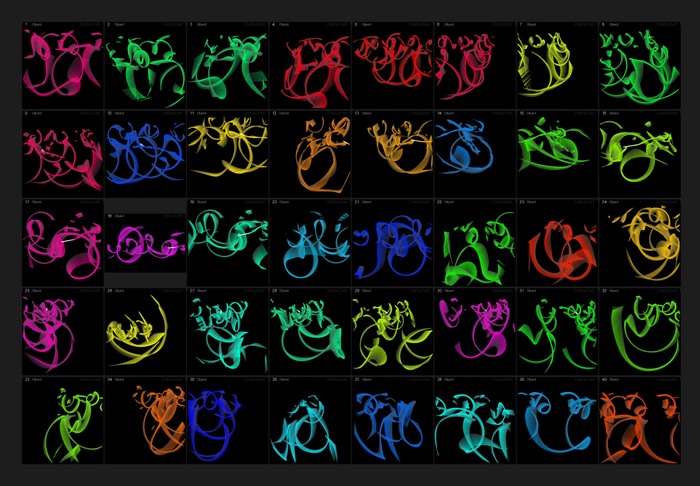 The wanding samples from recorded 2D data will be loaded. 4) Motive: Calibration pane. Press Calculate, and wait until the calculation process is complete. 5) Motive: Calibration pane. Apply Result and export the calibration file. File tab → Export Camera Calibration. 6) Load the recorded Ground Plane Take. 7) Open the saved calibration file. With the Ground Plane Take loaded in Motive, open the exported calibration file, and the saved camera calibration will be applied to the ground plane take. 8) Motive: Perspective View. From 2D data of the Ground Plane Take, select the calibration square markers. 9) Motive: Calibration pane: Ground Plane. Set the Ground plane. 10) Motive: Perspective View. Switch back to the Live mode. The recorded Take is now re-calibrated. The partial calibration feature allows you to update the calibration for some selection of cameras in a system. The way this feature works is by updating the position of the selected cameras relative to the already calibrated cameras. This means that you only need to wand in front of the selected cameras as long as there is at least one unselected camera that can also see the wand samples. This feature is especially helpful for high camera count systems where you only need to adjust a few cameras instead of re-calibrating the whole system. One common way to get into this situation is by bumping into a single camera. Partial calibrations allow you to quickly re-calibrate the single bumped camera that is now out of place. This feature is also useful for those who need to do a calibration without changing the location of the ground plane. The reason the ground plane does not need to be reset is because as long as there is at least one unselected camera Motive can use that camera to retain the position of the ground plane relative to the cameras. Partial Volume Calibration pop-up dialogue. From the Devices pane, select the camera that has been moved or added. Set Calibration Type: In most cases you will want to set this to Full, but if the camera only moved slightly Refine works as well. From the Calibration Pane, click Start Wanding. A pop-up dialogue will appear indicating that only selected cameras are being calibrated. Choose Calibrate Selected Cameras from the dialogue window. Wave the calibration wand mainly within the view of the selected cameras. Click Calculate. At this point, only the selected cameras will have their calibration updated. This feature relies on the fact that the unselected cameras are in a good calibration state. If the unselected cameras are out of calibration, then using this feature will return bad calibration. Partial calibration does not update the calibration of unselected cameras. However, the calibration report that Motive provides does include all cameras that received samples, selected or unselected. The partial calibration process can also be used for adding new cameras onto existing calibration. Use Full calibration type in this case. › Q : It seems like the tracking measurements are scaled incorrectly. For example, I am seeing a 2m distance between two markers where the actual distance is only 1m. A: Tracking measurement scaling incorrectly is likely because the capture volume was calibrated with a mismatching calibration wand. In such cases, make sure the correct wand is specified under the OptiWand setting. › Q : The calibration wand does not get detected during the wanding process. A: This could happen for two main reasons. It could be happening either because the markers on the calibration wand have been displaced from the intended positions or because the marker surface has been scratched or damaged. In such cases, Motive will not be able to detect the calibration wand, and for this reason, always try to keep the calibration wand markers untouched and undistorted. If markers on the calibration wand have been damaged, please contact us to have them replaced. A: * Make sure you are not wanding too fast. If the wand moves too fast, the centroid of the captured markers would not be good enough for calibration. Remove all intermittent extraneous reflections that might appear during wanding. These reflections will introduce false data into the samples and affect the overall calibration unfavorably. This is also often introduced by reflective accessories that the person, who is wanding, is wearing. Keep this in mind and remove/mask all extraneous reflections. › Q : Is it possible to reconstruct a new set of 3D data using a different camera calibration file? Export a calibration (.cal) file from a previously recorded Take or from a fresh new calibration. Open the recorded Take that already contains the old calibration file that you wish to update. Load the new calibration file which was exported from the first step. Perform reconstruct and auto-label. The obtained 3D data will reflect the new camera calibration. › Q : Which calibration wand is a good size? A: In general, smaller calibration wands are suitable for calibrating smaller volumes, and larger calibration wands are suitable for calibrating larger volumes.